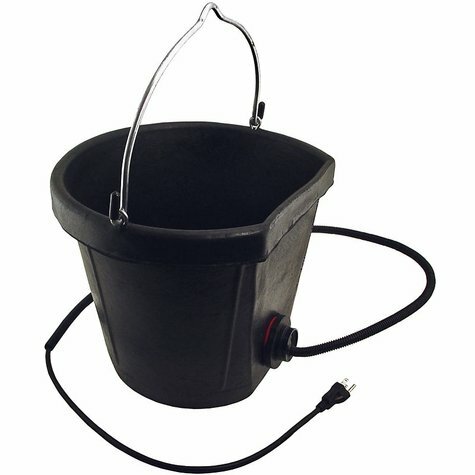 Heated Rubber 18-Quart Flat-Back Bucket by Farm Innovators. $49.95. "Glad I purchased this item." Glad I purchased this item. Does not get so warm to evaporate water and keeps thawed below 0. Pups are happy and not thirsty. These buckets are great!! Raise lab pups, and these have been great. "It's a reasonable product at a reasonable price." It's a reasonable product at a reasonable price. I've gone through a few of these because the seals at the bottom of the bucket will crack in the cold months of winter allowing water to get down into the coils. Now when I get new buckets I will silicone the bottom of the bucket, so it has better closure and less chance of splitting. I like the Osborne canine canteen the best, but currently they are out of stock. My dogs will chew through the rubber buckets, and in the course of the month fairly easily they need replaced. The canine canteen is indestructible! Definitely worth a few extra dollars. Flat back allows for wall hanging. Heat element prevents water from icing in winter. Great for dogs, horses, and other animals. Heavy-duty rubber construction. This bucket is stiff rubber and is NOT chew proof.